The ever popular Bob Burnett's Appliance and Bedding Center is back! Bob and his vendors will host us for a wonderful supper and awards event. And you'll see some fabulous appliances in action! 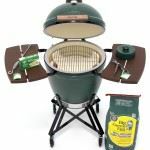 And some Big Green Egg News! Guess some lucky HBA member will be putting one in their car and taking it home that night. Bob is going to give one away! Must be present to win and one ticket per current member company. Can you smell the ribs now?